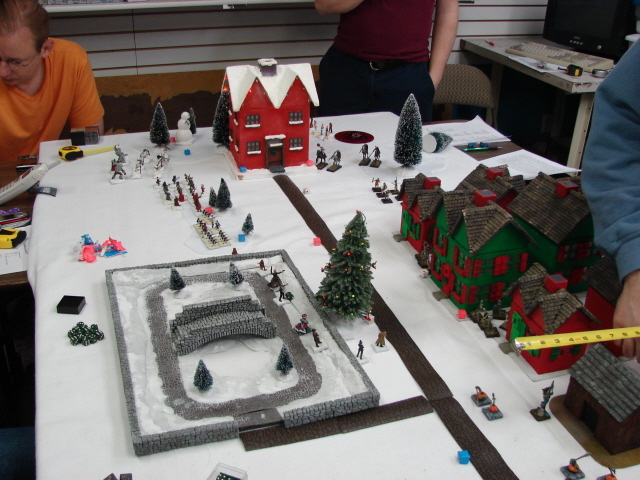 Sergei and I made up a Warlord scenario called Trouble in Christmastown. 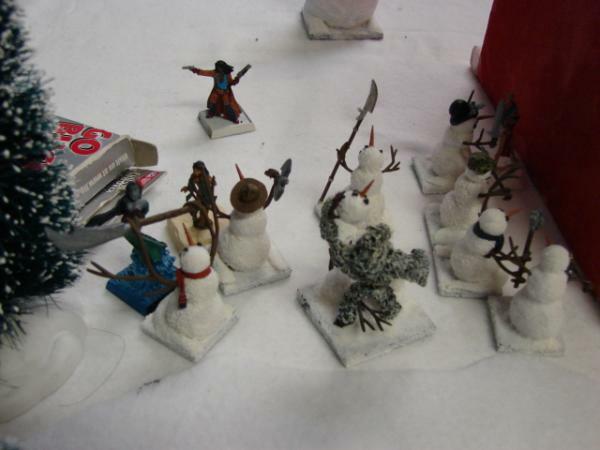 The back story is that the Nightmare King (Halloween) is tired of Christmas encroaching into his holiday season, so he has gathered his army and is going to the north pole to teach the fat guy a lesson. 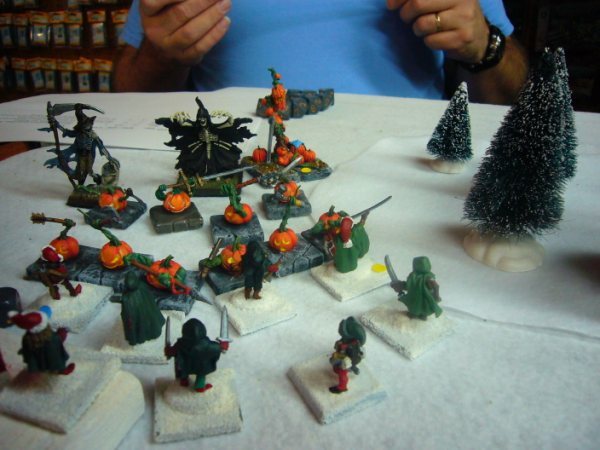 Much of the Halloween stuff could be used from our existing armies, but the Chirsmas stuff was a whole different story. 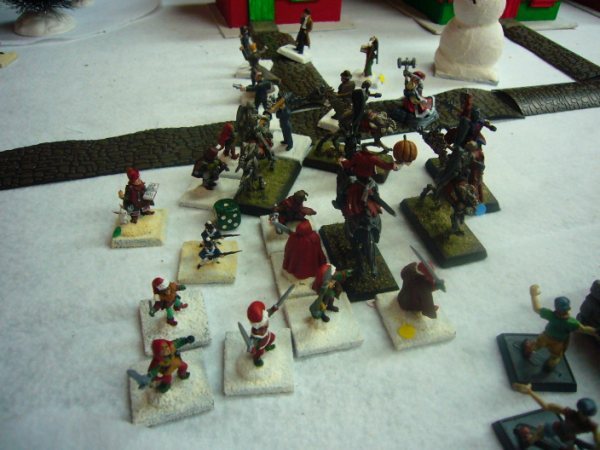 The past two months or so I've been converting and painting the Christmastown army. 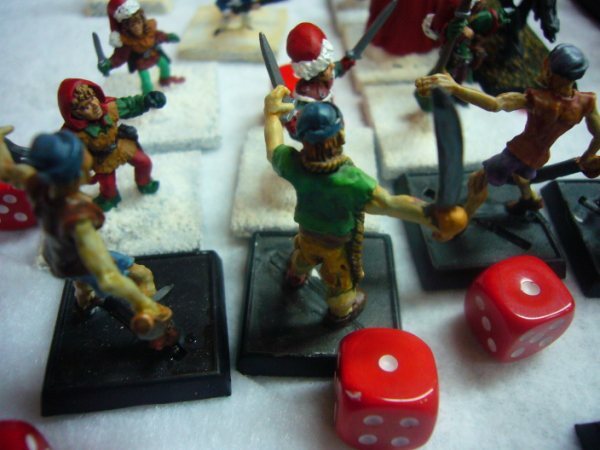 Well over two dozen Halflings, Gnomes, and at least one Dwarf fig were given Chirstmas hats and pointy shoes, About a dozen other minis were also done, plus Sergei did a marvelous job convering Heysik (Dwarf Cleric Warlord) into Santa. here are a couple pics from the game. This is Santa with his "Mall Security" detail, plus Trixie, his personal assistant. The security detail was a lot of fun, because they are nothing like thier name implies. They are very tough fighters and good shots, so the Halloween player who assumed mall security meant they would be easy meat was very surprised. We gave the Bumbles a special ability that allowed them to destroy a snow goon and use it as a snowball attack which would stun an opponent. 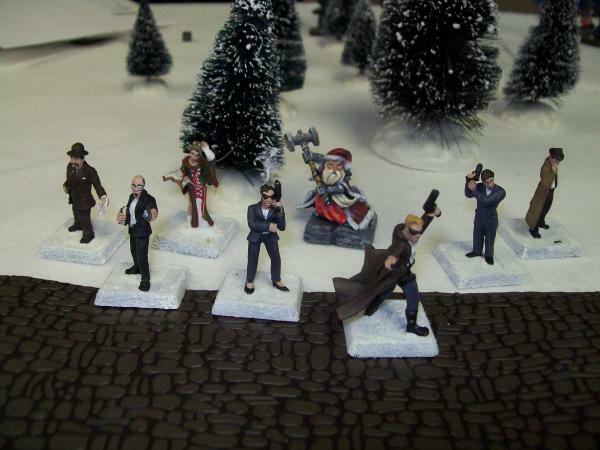 This fig begged for a modification to show the snowball SA in progress. The start of the game. Soon the bone piles were accumulating at both ends of the board. 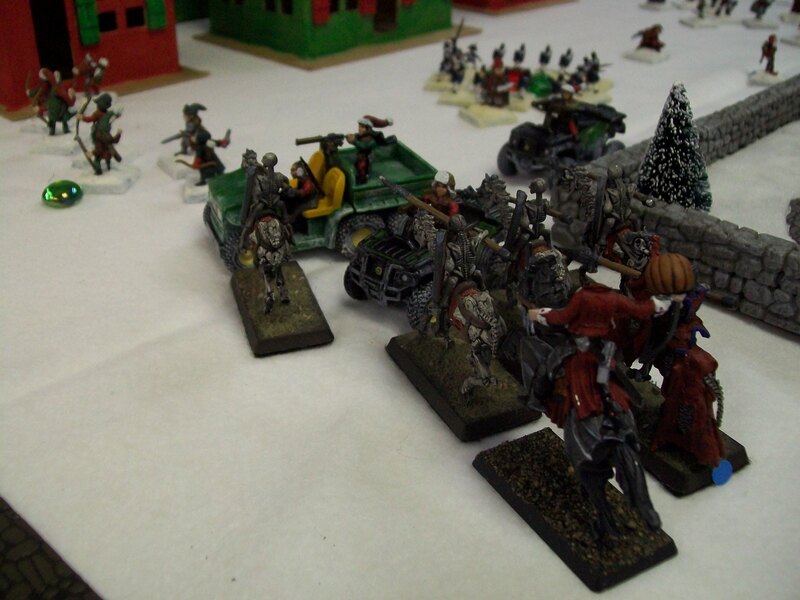 One of the first fights was the skeletal cavalry, with the headless horseman joining in to attack the Christmastown maintenence crew. Here the snow goons and F.R.O.S. 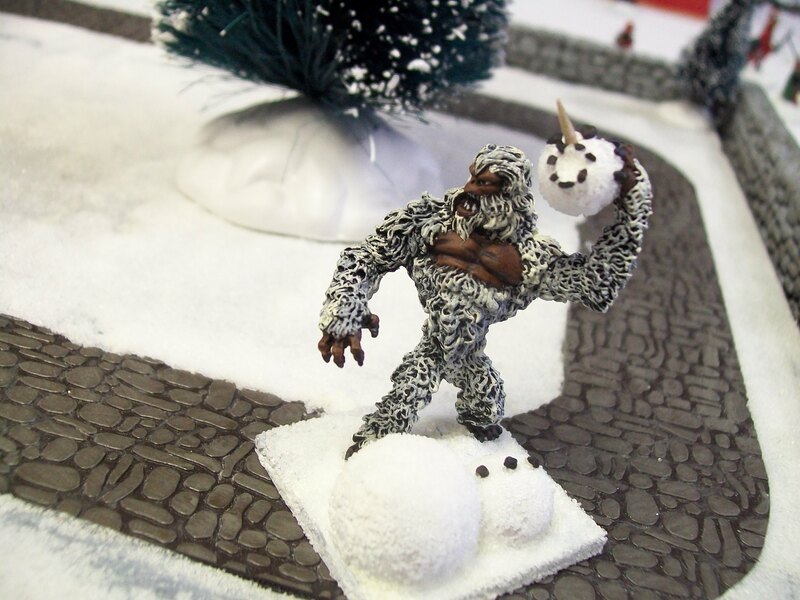 (Frosty Rockin' on Steroids) mix it up with the Rattling Bones unit. I don't recall why the Toymakers Union members have their backs turned, but I think it's pretty obvious how they feel about the non dues paying snow goons. Wow! 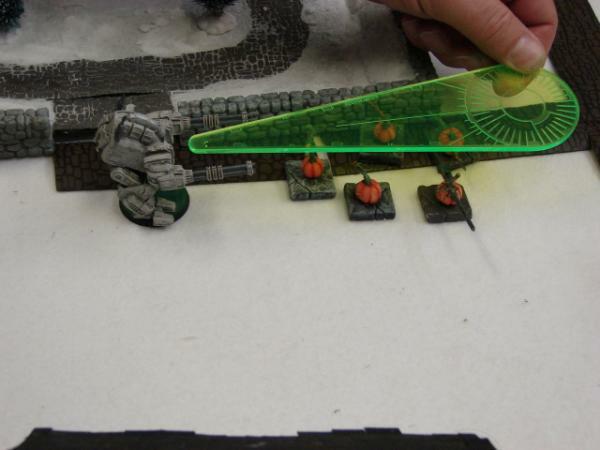 That is some neat conversions and a cool idea! It looks like lots of fun. That looks like an absolute riot to play! Thanks for sharing the pics and the conversion ideas, it's really great to see them in action. Man , that looks like a blast. Very cool. Cool idea! What did you use for thee headless horseman; I've been trying come up wth an appropriate mini for just that purpose. I used 03378: Santoine de Fronze, Pirate for the top, and 14186: Lord Vandrian, Necropolis Solo for the bottom. The Punkin' is a standard DHL pumpkin. I wanted to use one of the Jak-o-lanterns, but those are to big. It took a bit or cutting and trimming, but it worked pretty well. At first I was afraid that Vandrian's army would look wrong, but it looks just fine. We played five games total. Christmas won three of the five, but the last game was incredibly close. We thought Halloween had it all but wrapped up when Christmas went on a frezy and killed off all three of Halloween's Legends. 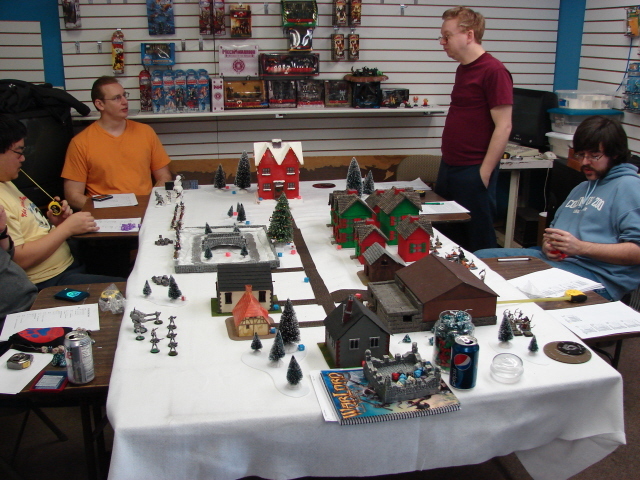 See the Warlord General section for a post about the upcoming final game. 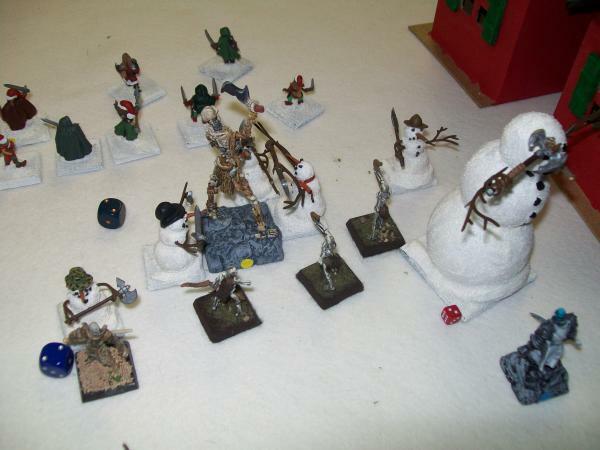 Here is a shot of the Christmas Elves attacking the Nightmare King's minions. And the silly Zombies just will not die. They couldn't hit much, but they made tough roll after tough roll. The Fall of the Great Pumpkin - Impossible you say? 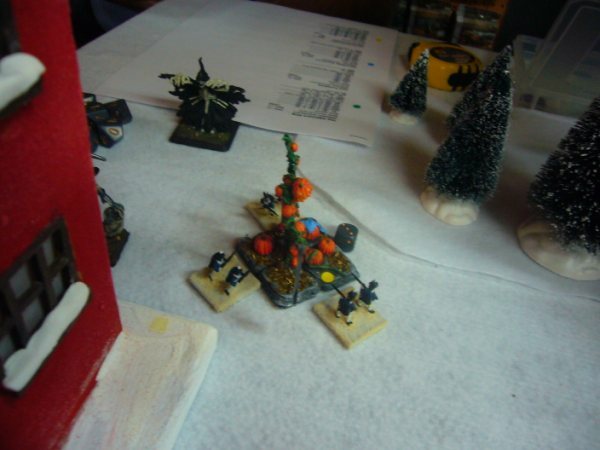 In two different games the Nutcracker soldiers beat down the Great Pumpkin. 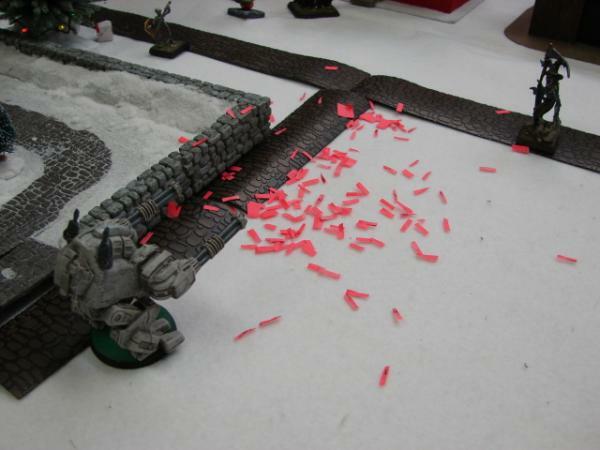 In normal warlord terms, that is goblins whomping on the Bone Horror. They never actually killed the Great Pumpkin, but they beat him down far enough that he was taken out soon after he broke up all those toys. All I can say for these little Nutcrackers is that their bite is actually worse than their bark. 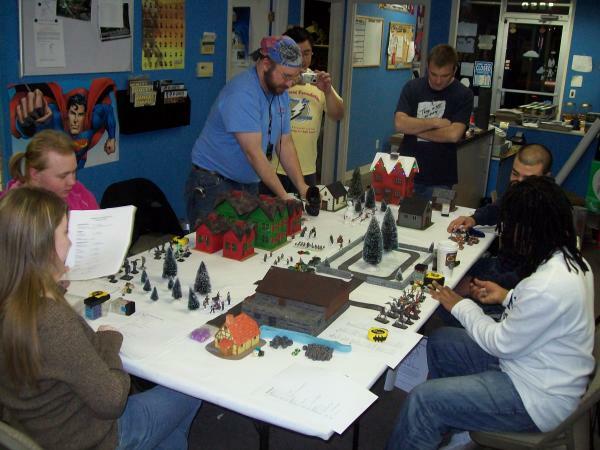 Awesome scenario! What a great job on everything, a major undertaking. A few of the pics from the final game. Dang. Wish I could have been there! Three packs of different sized wooden balls from Hobby Lobby. I sanded down the areas where it was going to meet up with another wooden ball or the base. Just enough to give it flat area to glue. Do all three parts of each snowman together. That way you can match up the flat areas. The arms are from a Woodland Scenics tree set. I cut one pair of limbs off a tree piece, drilled a hole on each side of the snowman body, and stuck them in. The plastic trees are flixible enough that you can bend them to different shapes. 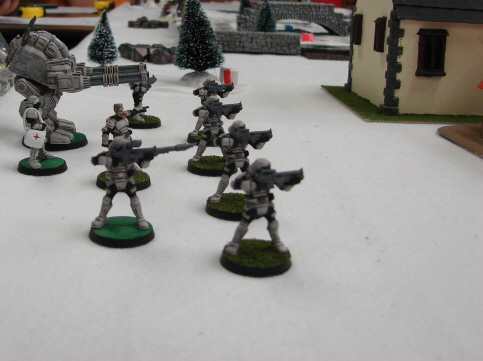 The weapons are from my stash of bits from the Reaper Boneyard. I don't recall what I used for the snow effect. I think it was salt sprinkled over wet white paint and then painted with another coat of white. Can't say for sure though. The face is a toothpick tip and bits from Woodland Scenics Coal Ballast. The Hats, Scarfs and such were sculped by me. And hey, there was a pic of the maintenence crew with their MG armed Gator & 4-Wheeler!